Model WJ-11 is a BACnet controller that controls facility equipment such as building air conditioning equipment and plumbing equipment. This product (Model WJ-11) is a BACnet controller that controls facility equipment such as building air conditioning equipment and plumbing equipment. This product uses I/Os that have been built for the instrumentation along with control application programs to realize optimal control. 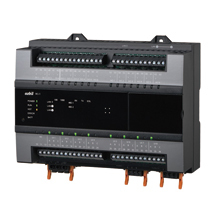 Furthermore, it has high expandability, including the ability to add Advanced Remote I/O Modules (Model RJ-11) and control application programs, allowing it to adapt to operation changes and renovation work.